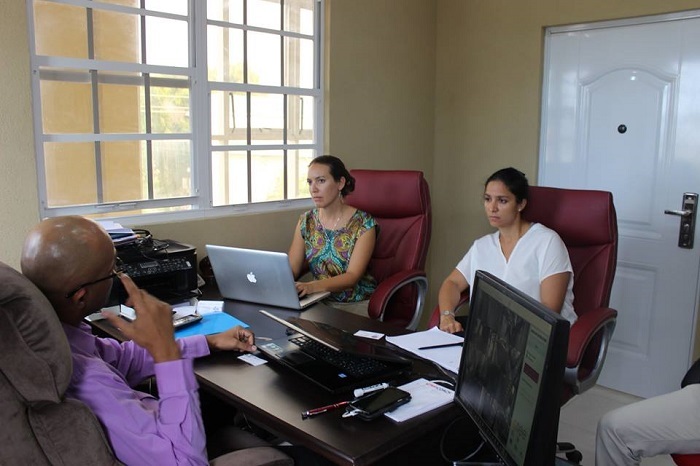 On April 19, 2016, the GCCI President, Mr. Vishnu Doerga, met with a team from the PROCASUR Corporation to discuss the rural youth employment situation in Guyana. The PROCASUR team, which includes Ms. Alda Berardinelli and Ms. Anne Desrochers, has been contracted by the FAO to support the implementation of several components of the FAO/IFAD youth project titled “Strengthening Decent Rural Employment Opportunities for Young Women and Men in the Caribbean”. The Ministry of Agriculture is also a collaborator on the project. During the meeting with Mr. Doerga, they discussed the rural youth employment situation in Guyana, opportunities for employment for rural youth, and best practices and success stories regarding rural youth employment creation and development. The youth project aims to facilitate decent employment opportunities for rural youth to contribute to better food and feed systems in the Caribbean, and to stimulate an understanding and increase participation in entrepreneurship in agriculture and related industries. The project is being implemented in Barbados, Grenada, St. Vincent, St. Lucia, Guyana, Belize, Cuba, Haiti and Dominican Republic. Gratifying to see ongoing tangible support by GCCI for youth centred initiatives across Guyana!